Many readers of this blog still have indelible memories of May 9, 1970, when America's incursion into Cambodia, the military draft and the killing of 4 unarmed college students by members of the Ohio National Guard at a mass anti-war protest at Kent State University, resulted in hundreds of thousands of students, teachers, veterans, moms, dads and grandparents from virtually every state in the union descending and marching upon the nation's capitol. It was a difficult, horrifically polarizing time. And even though this particular march - which got tons of publicity all over the world - did not immediately end the draft (that wouldn't happen until January of 1973) nor bring our troops home from South East Asia (which officially occurred on April 30, 1975), it did energize and politicize an entire generation of young Americans. 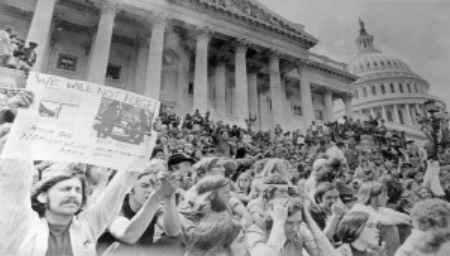 Indeed, many of those who marched on Washington on May 9, 1970 (myself included) were turned into lifelong political activists; people who ever since have been incapable of sitting idly by while injustice, insanity and gross insensitivity continue ruling the corridors of power. Back in those days - as many will recall - we were tagged with every name in the book: long-haired-hippie-drug-addled-free-love-Communist-conspirators, unwashed-traitorous vermin, etc. Many had their phones tapped by J. Edgar Hoover's FBI, and had places of "honor" on President Richard Nixon's infamous "enemies list." It was, to say the least, a trying time. But it was also a time when many of us found our political voice and first came to understand how much "We the People" can accomplish when speaking (and shouting) with a single voice. On March 3, 1913, thousands of women - with upwards of half-a-million spectators watching - marched up Pennsylvania Avenue demanding suffrage rights. On August 18, 1920, the 19th Amendment was ratified, thus guaranteeing women the right to vote. On August 8, 1925, spurred by hatred of European Catholics, Jewish immigrants and African-Americans, and inspired by the silent film Birth of a Nation (in which Klansmen were portrayed as heroes), some 50-60,000 Klansman marched down Pennsylvania Avenue (all clad in Klan regalia) demanding a tightening of American immigration laws. On June 17, 1932, some 20,000 veterans of "The Great War" (WWI) assembled in Washington for the so-called "bonus march," in which they demanded that the $1,000.00 "bonus" promised them at the end of the war, be paid immediately. They were met with armed opposition from Army Chief of Staff Gen. Douglas MacArthur and his adjutant, Maj. Dwight D. Eisenhower. Best remembered for Martin Luther King, Jr.’s “I Have a Dream” speech, this enormous demonstration, held on August 28, 1963 called for fighting injustice and inequality against African-Americans. The march united an assembly of 160,000 black people and 60,000 white people, who gave a list of “10 Demands”, including everything from desegregation of school districts to fair employment policies. The march and the many other forms of protest that fell under the Civil Rights Movement led to the Voting Rights Act of 1965 and the Civil Rights Act of 1968—though the struggle for equality continues in different forms today. January 20, 2017: the day of '45's inauguration, hundreds of thousands of demonstrators - mostly women - gathered on the steps of the Lincoln Memorial and lined the frozen-over Reflecting Pool to rally for women’s rights, urge women to run for public office and call on citizens to fully engage on issues from sexual assault and racial equality to immigrant protections and gun violence. Largely unnoticed by the press, the marchers in Washington were joined by an estimated total of 2.6 million women who came out to protest across the United States. And finally, this coming March 24, will be the "March for Our Lives," a gathering of who knows how many hundreds of thousands of American school children (members of "Generation Z"), their friends and families who will descend upon the nation's capitol protesting in favor of serious, meaningful gun safety legislation. Historically, the effect these mass gatherings have had on their target issues have been a mixed bag: the 1913 suffragette, 1932 Bonus and 1963 civil rights and 1970 anti-war marches were largely successful. (In the case of the Bonus Army's demand to be paid for their service in WWI, Congress passed (over FDR's veto) the 1936 Adjusted Compensation Payment Act, which guaranteed the veterans nearly $2.5 billion in payments.) Then too, some marches, like the 1925 KKK rally had little, if any effect (President Coolidge had already signed the highly restrictive, xenophobic Johnson Reed Immigration Act in 1924, nearly a year before their gathering). Precisely what immediate effect the upcoming march for gun safety legislation will have is anyone's guess. A clear majority of the members of Congress and the White House are so closely aligned with the demands and wishes of the National Rifle Association that even such common-sense measures as reinstituting the ban on Assault Weapons, severely limiting the amount of rounds of ammunition in a single magazine, denying weapons to those on terror watch lists or simply raising the age at which a young person can purchase a gun seem, at this point in time, far out of reach. Perhaps these - and a host of other measures - won't even get a full airing out on the floor of Congress . . . which would be a sin. One thing, however, which will likely occur as a result of this march is precisely what occurred to those generations which marched on Washington in 1913, 1963, 1970, and 2017: a lifelong passion for political involvement, and the certain knowledge that together, we the people, can often be the ultimate stimulus for meaningful change. There is an old saw which goes "The more things change, the more they remain the same." Well, in this case, just as the protesters of my/our generation endured the jibes and catcalls of the hawks and the deaf ears of many members of the entrenched political elites, so too are the members of the Stoneman Douglas generation (the "Millenials") catching grief and tone deafness from both the Trumpeteers and today's entrenched political class. But this younger generation, like that of the '60s and '70s - now mostly receiving Social Security - shall succeed . . . perhaps not tomorrow or next week for soon and perhaps forever. For they - like we - shall soon be casting their first votes, propelled by the fuel of activism and unwilling to sit on the sidelines letting others bolster the status quo. 400 days down, 1,157 days to go.